Irreversible Decline or Imminent Victory? Has America won the operational battle but lost the ideological contest against al Qaeda? How has Bin Laden's death affected the organization? What is the effect of the Arab Spring on al Qaeda? Is maintaining American troops in Afghanistan essential? Should the United States declare on its own an end to the war on al Qaeda? More than ten years after 9/11, there is still remarkable lack of consensus among analysts' assessments of al Qaeda's current condition and future capabilities. Almost every issue is debated: Whether America has won the operational battle but lost the ideological contest; whether homegrown terrorism is a growing threat; whether maintaining American troops in Afghanistan is essential; whether the United States ought to declare on its own an end to the war on al Qaeda. Part of the debate is driven by political agendas, but the arguments derive from the fact that al Qaeda is many things at once and must be viewed in all of its various dimensions. This essay examines a number of these issues in light of recent developments — the death of Osama bin Laden, the Arab Spring, and the American withdrawal from Iraq. In each case, it drives toward a bottom line. In the final analysis, it is a personal view. Al Qaeda sees itself engaged in an existential struggle with Western infidels determined to destroy Islam. Al Qaeda sees the United States as weakened economically and weary of a costly war — as the Soviet Union was before its withdrawal from Afghanistan and subsequent collapse. Al Qaeda's leaders attribute great importance to Afghanistan because the war against Soviet forces in Afghanistan provided al Qaeda's initial reason for being and because a Taliban victory is the best hope for al Qaeda's survival. Either the United States will develop a less costly military strategy to contain the Taliban for a longer time or it will accept the risks associated with withdrawal from Afghanistan, because the current deployment of forces is politically unsustainable. 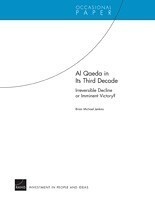 Jenkins, Brian Michael, Al Qaeda in Its Third Decade: Irreversible Decline or Imminent Victory?. Santa Monica, CA: RAND Corporation, 2012. https://www.rand.org/pubs/occasional_papers/OP362.html. Also available in print form.